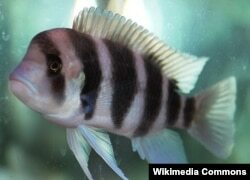 Africa's Lake Tanganyika has more biodiversity than the Galapagos Islands. It is the world’s longest freshwater lake and is home to many of the colorful freshwater fish (called cichlids) that fill home aquariums. Hundreds of the species that call the lake home can only be found there. But those species are being threatened by human activities. Commercial fishing practices are playing a role but the biggest threat has been around longer than the fisheries, according to a study in PNAS that threat is climate change. 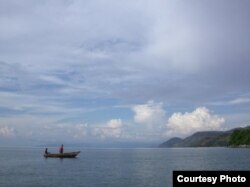 Lake Tanganyika, which laps the border of Tanzania, the Democratic Republic of the Congo, Burundi and Zambia, provides anywhere from one-third to one-half of the animal protein that local villages need. Commercial fishing began in the lake in the 1950's, and now hauls in over 200,000 tons of fish a year. But in the 1990s, fishermen and local villages started noticing that the catch was declining. There has been debate in academic circles whether overfishing or climate change is primarily responsible for the decline in fish populations seen over the last few decades. Past research has shown that the lake's surface water temperature has been increasing over the last 150 years. In an email to VOA, Jouko Sarvala, professor emeritus in the biology department at Finland's University of Turku, noted that although the temperature of the lake was rising, local fisheries reported an increase in their catches between the 1950s and 1970s. For the next two decades, the size of catches fluctuated in response to changes in fishery practices. It wasn’t until the early 2000s that fishermen started noticing a clear decline. In order to assess the impact of climate change on the fishery, a group of U.S. researchers extracted sediment cores from various locations in Lake Tanganyika. The layers of mud contain fossils which tell the story of rises and falls in fish populations. The researchers compared those shifts with temperature data that goes back 150 years. They found the fluctuation of the fish population followed the natural warming and cooling cycles of the lake. But the researchers also saw a population decrease that followed the overall warming that began 150 years ago, around the Industrial Revolution. That indicated that the decline in fish had begun well before commercial fishing began in the area. “What this tells us is that the fish are responding primarily, not exclusively, [to climate change]. Fishing is certainly an important part of the equation and we have to take it into account when developing any management strategy but it ... really comes down to climate change,” explains Andrew Cohen, a professor in the department of Geology at the University of Arizona and lead author of the study. Sarvala acknowledges the study establishes, for the first time, a credible relationship between increasing lake temperature and decreasing fish populations, confirming that currently, both climate and fishermen are impacting the lake. Peter McIntyre, an associate professor of zoology at the University of Wisconsin-Madison who also participated in the study, estimated a 38% loss of habitat for the fish and snails in the lake. “That’s a staggering loss and something that had not been documented before,” he tells VOA. Most of the aquatic life lives in a “bathtub ring of biodiversity” along the coasts or at the very bottom of the lake says McIntyre. This is because having a maximum depth of almost 1500 meters makes it difficult to disperse oxygen throughout the lake. Oxygen enters the surface water from the air and is usually mixed to depths of 100 meters by winds. The temperature of the water decreases as you go deeper into the lake meaning the water also becomes heavier as you descend. Climate change causes the outside temperature to rise also warming the surface water, making it lighter. The difference in density between the much lighter surface water that holds oxygen and the cold water that holds nutrients means the wind can't mix the water to normal depths. Oxygen doesn’t go down as far and fish food doesn’t come up. The effects of climate change are visible on all scales, from the melting of ice sheets in the Arctic to mice going extinct because their habitat is underwater. Just like the polar bears and mice losing their ecosystems, the people who rely on the fish from Lake Tanganyika cannot do much to stop climate change, but they’re working on strategies to mitigate the effects.